BY WAY OF AN INTRODUCTION.... Having spent 14 years making Native American (NA) style flutes, it seemed the right time to close the workshop door and move on to doing something which I have been trying to get round to for the last 6 years, namely recording an album using these instruments. 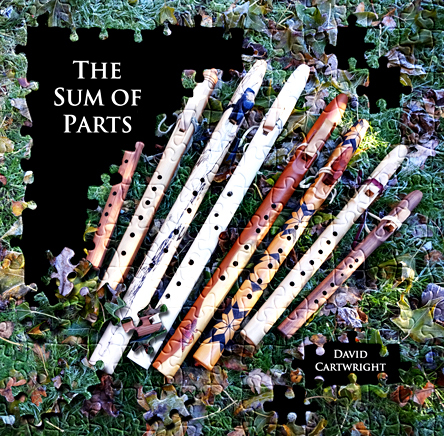 Having made several hundred - and I thank the Universe for bringing people to my door and helping me meet the challenges of making their flute vision happen - I have two dozen or so of my own that never left the workshop; this first album begins their chance to sing to the world. I have listened to many NA flute recordings over the years and love the skill, quality and beauty of the works of masters such as Roland Roybal, Joseph Fire Crow, Andrew Vasquez, Mary Youngblood and, of course, the legendary Carlos Nakai. There are equally a myriad of wonderful recordings and CDs that use the beautiful haunting sounds of the flutes to soothe the Mind and Spirit. 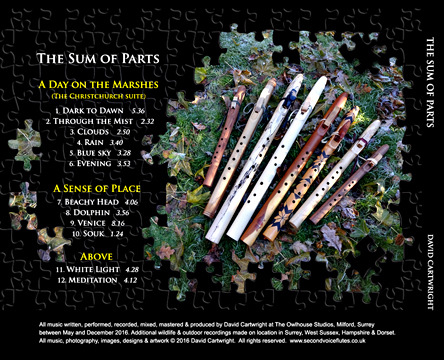 But I have always felt there are some musical genres and styles, such as techno and orchestral, that, beyond people like my mentor Nigel Shaw at Seventh Wave Music, have as yet had relatively little NA flute input; that thought formed one of the cornerstones of this album. My other main aim always was to produce emotive, atmospheric, relaxing pieces that take the listener on journeys to real places and beautiful landscapes backed by the sounds of the local wildlife and elements, and which included NA flutes within them, but without the flutes necessarily being the main sound. To me, the sounds of these instruments are often more striking and effective when brought into larger pieces of music and intertwined with other instruments. I had originally thought of writing music to go behind video, and had actually starting shooting film, but I soon realised that the eye almost always overcomes the ear, and I found the music could become secondary to the visual. So I abandoned the �soundtrack� idea for now and went for a different approach. As a friend pointed out on hearing the first tracks, the music here is rather cinematic in that the pieces, which are often compositionally mixed and not necessarily all that long, take you on journeys and to places far away. The beauty of that is that everyone will generate their own images and films in their head; all I have done is offered small possible starting points by giving names to the tracks and describing where their inspiration came from. I hope by doing things this way round I have created tracks that describe places, tell stories and act as a balm for the Soul, ultimately coming together as The Sum of Parts. There is more to come and I am now working on another album of what could be called �relax and drift away� music. Peace and Light to you all. ABOUT THE MUSIC... I have to say from the outset that much of what you hear on this album just �arrived� as if it was given to me from above...having built a MIDI software orchestra, I either laid hands on the keyboard or picked up a flute or guitar and recorded what dropped out in the first instance! From those basic ideas and melodies it was a process of composing, developing, building, orchestrating and recording each piece until it described as best it could what I was feeling and seeing. All but one of the tracks, arranged into three main sections, have been inspired by trips Linda and I have made over the last four years. A Day on the Marshes - an autumn break in Christchurch, Dorset. Misty coastal walks over Hengistbury Head and many hours birdwatching, sound recording and relaxing on the beautiful Stanpit Marsh Nature Reserve in the middle of Christchurch harbour. 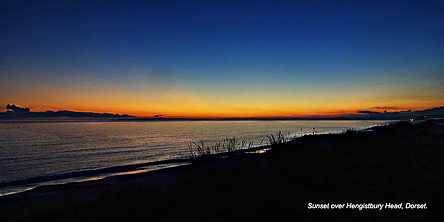 A stunningly peaceful location with huge skies, lovely sea and magnificent views, all constantly shifting as the day unfolds from dawn through light to dark again, reflected as a Suite of six movements. Flutes: high A Holly, mid G Cherry, mid F pent 5 Yew, high D Walnut, Low D spalted Beech. Guitars: Yamaha acoustic, CMI Les Paul electric. A Sense of Place - Beachy Head in February, high cliffs, crashing seas, lashing rain, howling wind threatening to pitch us off the edge, and one of the most �alive� experiences ever! Elemental and beautiful in the extreme...and then the sun came out. Flutes: High A Holly, mid G pyrographed Lime. Dolphin was actually the first track to materialise, stemming from a whale-watching trip off the California coast. We had a huge pod of adult and very young common and Risso dolphins leaping and playing around the boat as it sped along. Sheer joy, but as soon as a whale showed up, they disappeared. Flutes: Low E Western Red Cedar, high B Redwood. 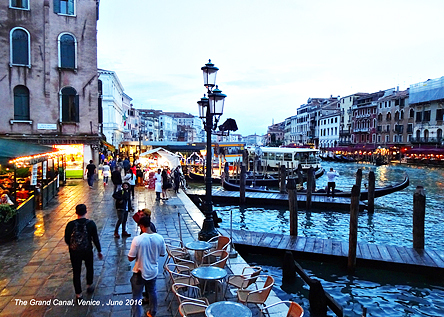 Venice speaks for itself. Four days walking around one of the most beautiful, wondrous places in the world in June provided more experiences, memories and images than could be translated into a whole album�s worth of music. Go there...you live the history with every step and the mix of European, Middle East and Far East cultures shows through everywhere. Strip away the tourists and there is a mesmerising working city underneath. So, there are four phases to the piece reflecting the lulling rocking of a gondola ride, a walk through the narrow streets and canal banks, an homage to the stunning middle eastern architecture, and a final journey by water taxi (vaporetto) up the Grand Canal. Flutes:Low E Western Red Cedar, high A Holly, high D Walnut. Souk, on the other hand, has no specific journey behind it but comes mainly as an echo from the Venice trip, and is also here to give a hint (that�s why it�s short) of where some of the next album may be heading.... Flute: low E Hitzaz scale tuned Lime. Above - White Light was written as a piece reflecting the escape from city life to the peace and serenity of a rural retreat, but it also became (almost of its own volition) a metaphor for the passage from youth to old age and beyond.... Flute: High A Holly. Meditation, sitting on the beautiful North York Moors, is simply that - a space to let the Mind and Spirit roam and hopefully a fitting end piece. Flutes: Low D spalted Beech, high A Holly. AND FINALLY... Thanks and all my love goes first and foremost to my wife Linda, my soul-mate and partner for over 30 years, for encouragement, support, suggestions and cups of tea during the long months of recording. As the picture on our wall says �If I had my time again, I�d find you sooner so I could love you longer�; we have a lovely life together. And love and thanks to our four wonderful children, Hannah, Jamie, Will and Niamh who kept telling me to make this album - and loads of love also to Simon, Sarah, Izzy and Rupert, and Emma, Ian and William. You all mean everything to us. Much love and thanks also to my dad who at 95 is still going strong and has been a constant support throughout. Many thanks to Nigel Shaw and Carolyn Hillyer for inspiration and support getting me going in flutemaking. And finally, love and hugs to Dario, Irina and Masha - you are such wonderful special friends. All prices include postage. MP3 downloads are handled and paid for (credit card, Paypal or cheque) through CD Baby, the biggest independent online CD download music store in the world (the price is in dollars but will convert to under £10). Payments for physical CDs are processed securely through the Paypal system (you do NOT have to have a Paypal account - just click the Buy Now button above, then Continue when you get to the Paypal page, then you can either login to your Paypal account or pay by Debit/Credit card). CDs are then mailed directly from Second Voice Flutes to the address given in the Paypal/Credit/Debit card payment process, so remember to fill in your name and postal delivery address when checking out!